A big thank you to Support Adoption for Pets for their support. 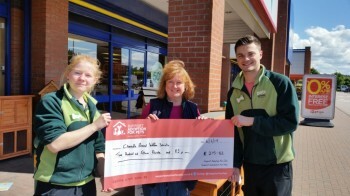 Further to their recent Make Me Smile Fundraising drive and raffle and thanks to the Uttoxeter Pets at Home Store and its’ customers, Lesley Blackburn on behalf of Cheadle & District Animal Welfare Society was recently delighted to accept a cheque for £215.82. Charity champions in Pets at Home stores across the country have been planning away and will be fundraising for Support Adoption For Pets from Wednesday 15th April until Tuesday 12th May. Once again Support Adoption For Pets wants to help support the work that Cheadle & District Animal Welfare Society does and will therefore be making a donation to us following the end of the event. Members of Cheadle Animal Welfare will be promoting both the MakeMeSmile Appeal and Cheadle Animal Welfare at the Pets at Home Uttoxeter Store on Friday 1st May.